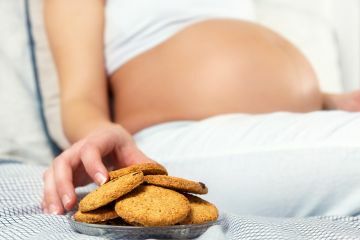 Could Too Many Cookies During Pregnancy Put Your Kid at Risk for ADHD? What you eat affects your babies in some surprising ways. Case in point: A poor prenatal diet is associated with kids’ ADHD risk. Here’s yet another reason to stick to a healthy diet throughout pregnancy: A recent study finds a surprising link between what you eat and your child’s chances of developing ADHD. Researchers from King’s College London found that high-fat, high-sugar maternal diets have the potential to affect the function of the IGF2 gene, which affects fetal development in the region of the brain linked to ADHD. We don’t have too much information about how prenatal diet affects the brain in humans, but the link appears to be significant in animals. With this in mind, researchers attempted to create a clear picture of how this works in humans by studying two groups of British children aged 7 to 13—one group was composed of well-behaved children, the other of kids with conduct issues, which often go hand-in-hand with ADHD—selected from a larger study that had been tracking mothers and children since pregnancy. The mothers had filled out questionnaires detailing their pregnancy diets and blood samples from their umbilical cords had been taken, allowing researchers to test if methylation had occurred in the IGF2 gene there, as well as in blood samples of the children at age 7. The researchers found a link: Women who ate more processed foods and baked goods had higher rates of IGF2 methylation in the part of the children’s brains linked to ADHD—and their children appeared to have indicators of the disorder. But one expert says there might be another explanation: According to Ruth Milaniak, M.D., director of the neonatal neurodevelopmental follow-up program at Cohen Children's Medical Center in New Hyde Park, New York, there may be a different association at work. "Women who have ADHD who are hyperactive may impulsively overeat and impulsively make poor food decisions," Dr. Milaniak said. "We all know that genetics in some way play a part in ADHD, and before this study can be really generalized we need to look at the genetics of the mother." Does this study find confirmation of this link? No. Researchers found an association between maternal diet and ADHD risk, but could not confirm a cause-and-effect relationship. “There are many causes of ADHD and conduct problems, and usually many small influences are at work together, diet being one of them,” Dr. Barker said. With that being said, maintaining a healthy diet during pregnancy certainly can’t hurt. "Diet is important for a child's health and development," Dr. Barker said. So next time your pregnancy cravings demand something sugary or high-fat, try to indulge in moderation!